This is a more traditional view of a crocodile. Compared to this crocodile, yesterday's crocodile looks like a dolphin at Sea World doing tricks. Crocodiles can move surprisingly fast. Once I was photographing a crocodile on the river bank, from the safety of a boat, of course, and he darted into the water so fast that he splattered me with mud before I could pull back into the boat. Today is Sunday, so we have new photos posted on our Viva la Voyage travel photo site. Our photos this week show the Dalmatian Coast of Croatia. If you have not been there, please check out the our website this week. You are in for a treat. Here is a different reptile than the calm, harmless iguanas that I have shown several times during the last month. Unlike the iguana who was very close to me in the photo I showed yesterday, or the series of the iguana at the Tamarindo airport that I showed several weeks ago, here is a crocodile that you would not want to encounter in the wild, except from the safety of a boat. Yes, this crocodile is in the wild. I was in a boat, no more than 4 or 5 feet away (less than 2 meters). He was expecting the wildlife tour boat operator to throw out some food, so he came up out of the water to get a look and to be positioned to chomp on the food. It is common to see crocodiles on wildlife boat excursions in Palo Verde National Park. Usually, however, they are lurking just below the surface of the water with just their eyes and nose visible or lying in the mud on the river bank. It is very unusual to see the head of a crocodile angling all the way out of the water. This week on our Viva la Voyage travel photo website we are showing photos of Peru, particularly Machu Picchu, one of the wonders of the world. Was this iguana checking out the new condo building on the beach? To take my photo that I showed yesterday, I walked up from the beach to get a little closer to the building and to have a view without as many trees in the way. After I took the photo, I turned around to walk back towards the beach and found myself almost face to face with this iguana on a low branch. Green iguanas blend in well with leaves, as I have shown in some of my past photos. Black iguanas like this one are well camouflaged when sitting on a branch. They are quiet, usually still, and often you will not know they are nearby unless you keep a trained eye looking for them. As more condos are built in the area, hopefully there will still be enough vegetation for the wildlife. The Nobel Peace Prize winning President of Costa Rica, Oscar Arias, adopted restrictions that for new buildings along the Pacific ocean will require that new developments can build or pave only half of the land, and the remainder must be left in vegetation. Here is a view of the new Crystal Sands condo from the beach. In Costa Rica, the first 50 meters from the ocean is public property. We can walk along the beach from our condo in Playa Langosta around San Francisco Point to Tamarindo, even though there are luxury homes and condos along the beach. Similarly, people walk along the beach behind our beach front condo, which is just a couple hundred meters down the beach from this location. Playa Langosta is a quiet residential area. We might see some a few people walk along the beach about every 5 or 10 minutes when we are sitting on our balcony. Most of the time, we have a view of the beach and ocean without anyone visible. Tomorrow, I will show you what was lurking in the bushes right next to me when I took this photo. I received a comment yesterday from Jacob (of Ocala, Florida Daily Photo) asking if the reason that most condos must be set back from the ocean 200 meters is to protect them from hurricanes. That is a good guess, particularly from someone in Florida, but that is not the reason. We do not get hurricane on the Pacific side of Costa Rica. If there is a hurricane on the Caribbean side, which is unusual because Costa Rica is south of the hurricane belt, there might be some winds on the Pacific side as the giant low pressure system of a hurricane can cause wind. The hurricanes do not cross the high spine of mountains in the central part of the country. The reason for the building restrictions is to preserve the environment. In my photo showing an overview of Tamarindo several days ago, a new condo building is visible above the tree line on Playa Langosta near the San Francisco Point. Here is a view of it from the water. Like our condo in Playa Langosta, this parcel of property must have been "grandfathered" before the law took effect that bans the construction of buildings within 200 meters of the ocean. This prominent location is much closer than 200 meters to the ocean. This building is called Crystal Sands. In real estate, a common expression, of course, is that the three most important things are "location, location, location." This building has location. Its developers are experiencing the effects of something other than location: timing. Several years ago this building would have likely sold out during construction. This is a different economy, however. The developer has taken out advertisements in magazines in the USA to seek buyers, and there is a sophisticated website with a virtual tour and other features. The website states that 2 bedroom, 2,600 square foot units (242 square meters) are priced at "under $900,000," and 2-story penthouses, with 4,200 square feet (390 square meters) are priced at $2 million USD. This is the new condo that was shown prominently in the overview photo of Tamarido that I posted the day before yesterday. This shows a contrast between the new and the old Tamarindo. The old Tamarindo are the little hostels and surfing shops left over from when Tamarindo was a sleepy fishing and surfing village. The new Tamarindo is illustrated by this large, new condo building which is called "Pacific Park." You can see the glass balconies and windows positioned to offer views of the beach and ocean, one block away. Pacific Park condos advertise that their building has brough "New York Style" to a Costa Rican beach. I don't know exactly what that means. There is a night club on the top floor of the building across the street from this condo. This week on our Viva la Voyage travel photo website we are showing photos of Peru, particularly Machu Picchu. This photo and yesterday's photo show the growth of Tamarindo in the last 4 years. I took this in December 2005 during a sunset ATV tour of the hills behind Tamarindo. This photo was taken from about the same location as yesterday's photo. You will note that looking out to the San Francisco point that divides Tamarindo, on the right, from Playa Langosta, there are no condos peaking above the tree line. Today, there is the big white condo in the middle of town, and several new 7-story condos in Playa Langosta, including one on the ocean near the point. I will show more of them during the next couple of days. I cannot show the "before-and-after" photos that some Daily Photo bloggers show, such as Jarart of Prescott (Arizona) Area Daily Photo. Her father in law has photos from decades ago that she can post to contrast with her photos today. I had never gone to Costa Rica until December 2005, so those are the earliest photos I can post. However, even in just 4 years there has been a significant change and growth in Tamarindo, as yesterday's and today's photo show. This photo also shows how the southern end of Tamarindo beach is protected from the full force of the ocean's waves by the off shore volcanic reef and island that continues out from San Francisco point. The sheltering effects of the reef and island allows people to choose how big they want the waves for swimming and surfing. There will be larger waves in the main part of Tamarindo beach, which is to the right of the area shown in this photo, and smaller waves in the area of the beach shown in this photo. At the southern end of Tamarindo Bay the protection provided by the reef and island allows boats to be moored in the Bay. Tamarindo has plenty of fishing and snorkeling/excursion boats for tourists. This week on our Viva la Voyage travel photo website we are showing photos of Peru, particularly Machu Picchu. It is one of the most remarkable places on earth. This is an overview of Tamarindo from the top of the hill the borders the town. Yes, you are looking at "downtown" Tamarindo. If it were not for the new high rise condos, the view would still be dominated by lush, green trees. You can see the effects of condo development of the past 6 or 7 years. This photo shows the south end of Tamarindo beach, San Francisco point, and arond the point in the background is Langosta Beach. Two high rise condos in Playa Langosta are visible, and I will show more photos of one of them in the days ahead. 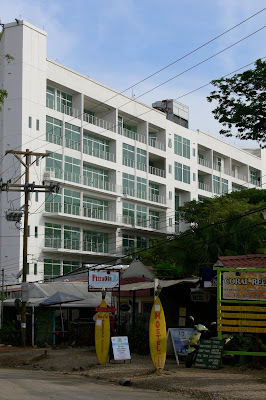 The large white building in the middle of town is the new Pacific Park condo, which advertises that it has brought "New York Style" to a Costa Rica beach. I will show more of it the day after tomorrow. Tomorrow, I will show a photo to contrast with this scene. The introduction of international flights direct from the USA and Canada to the airport in Liberia, one hour away, about 10 years ago caused the rapid development of condos and vacation homes in the area, marketed for foreigners. 20% of the international travelers to Costa Rica now fly to Liberia rather than the capital of San Jose. That should increase in the future as a new airport terminal in Liberia will be built beginning in a couple of months. Today is Sunday, so we have new photos on our Viva la Voyage travel photo website. This week we are showing photos of Peru, particularly Machu Picchu. Continuing with the before-and-after series, here is our Langosta Beach condo building in a photo taken by my son during his gyrocopter ride. This is the same building that was shown under construction yesterday. You can see the swimming pool that I showed a few days ago. The two top floors are two-story, three-bedroom penthouse units, with balconies on both floors, that sell for about one million U.S. Dollars. Our condo is on the second floor, right by the palm trees near the center of the building. We became interested in this building during our first trip to Costa Rica in December 2005, which is why I took some photos of it at that time. Even though it was still early in construction, all of the condo units in the building were already sold. More than a year later we bought the condo from one of the original purchasers while the building was still under construction. 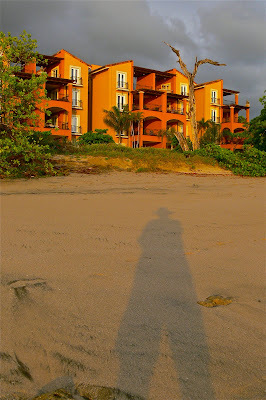 Several years ago Costa Rican beach front condo developments were selling out in the pre-construction phase. Developers were able to finance the construction through the deposit payments from the purchasers. With the recession in the USA, American buyers today do not have the value of their real estate or investments to use to purchase vacation property in Costa Rica, so the condos are not selling as rapidly. 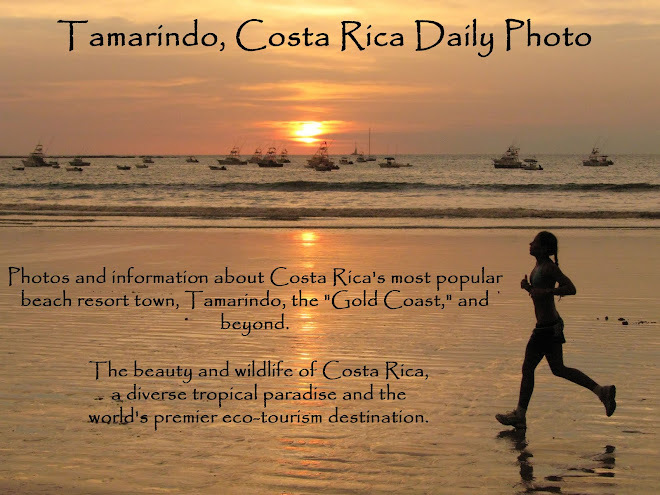 This week on our travel photo site, Viva la Voyage, we happen to be showing photos from Costa Rica, which of course is what I show in this site every day. Some of our favorite Costa Rica photos are featured this week. This is another photo of our condo building under construction in December 2005. This provides a glimpse of construction materials and methods in Costa Rica. Note that the walls are made of masonry reinforced with rebar. That provides strength in case there is an earthquake. Even interior walls are masonry. The walls are covered with a very smooth plaster-like cement on the inside. You can see several construction workers in the warm December sun. Many construction workers in Costa Rica are immigrants or migrant construction labor from Nicaragua. This photo also shows differences in construction practices between the developing world and the USA. My wife and I have knowledge of the standards of the U.S. Occupational Safety and Health Administration. In the USA, an OSHA inspector would issue citations for the lack of guard rails on the scaffolding and the lack of caps on the rebar, among other things. Nevertheless, construction methods on Costa Rica are better than you would see in other Latin American countries. This construction site had a large crane to deliver materials. The quality of construction evident in this photo is good. Here is the opposite view of the photo that I showed yesterday. You will see the same dead tree trunk that was in the photo I posted the last two days, including from December 2005. My wife refers to the tree trunk as our "Georgia O'Keefe tree." The texture of the tree trunk, and colors of the sky and sea behind it, evoke the type of imagery that Julie imagines Georgia O'Keefe would have painted if she were sitting on the balcony of our condo, sharing this view with us. There are several problems with Julie's theory, of course. (1) Georgia O'Keefe died 20 years before our condo was built. (2) O'Keefe found her artistic and spiritual home in the high desert of New Mexico. The tropical environment of Costa Rica just does not seem like O'Keefe country to me. I do not have as much interest in the O'Keefe tree. I would rather speculate about the photos that her husband, Alfred Steiglitz, would have taken if he had visited Costa Rica with her. OK, I know what you are thinking. (1) How many glasses of wine to accompany the sunset did Dave and Julie have when they had this conversation; and (2) did they get baked in the sun too much during the day? Well, one of the benefits of having a place on the beach is to be able to contemplate questions that would not come to mind in a day at the office, or driving in traffic, or watching the news back in the USA. Here is our Langosta condo from the beach. Yes, that is my long shadow on the sand. This view is from a similar vantage point as the photo that I showed yesterday from when the condo was under construction in December 2005. You may notice that the same dead tree trunk that was standing in 2005 is still standing today. Our condo balcony is visible in this photo just to the right of the palm tree that is in the center of the photo. We love the angle that it provides for watching the sun set over the ocean, as you can tell from the angle of the shadow in this photo. Here is another view of our condo building from when it was under construction in December 2005. I seem to have evolved into a little "before and after" series, although in this case the "before" is only 4 years ago. Yesterday I showed the back of our condo building and the area where the swimming pool is today. This is the view of the back of the building from the beach, but at this stage only the ground floor had been erected, as shown yesterday. One thing that has not changed, however, is the little dead tree trunk you see on the beach. This is the same scene that I showed yesterday, taken in December 2005 when our condo building was under construction. The dirt piles that you see in this photo are located where the swimming pool is today. If you look closely, there is a worker standing on what would later become our balcony in the center right of the building. I took this photo on our first trip to Costa Rica because we had an interest in this building because it is rare to be able to get a condo so close to the ocean. There are setback requirements that apply to most parcels of land that prevent building so close to the ocean. This is a fish out of the water, which is a good thing, as the fish is concrete. This is the swimming pool at our Langosta Beach condo. 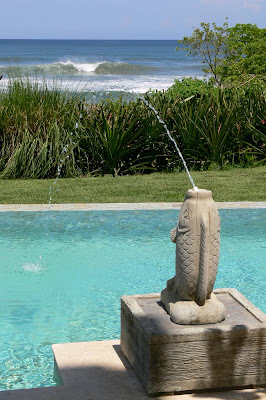 There are four of these fish fountains to add a little decorative and festive touch and to aerate and cool the water in the pool. This photo shows how close the pool is to the ocean. You can also see the thick border of pinuellas plants that provide a barrier between the pool and the beach so people from the beach do not walk up and use the pool, as the plants have very sharp thorns. I have in the past posted photos of pinuellas plants and Pablo, the gardener, who keeps the height of the plants trimmed with a machete so that the people at the pool and the ground floor condos have a view of the ocean. Today is Sunday, so we are showing new photos on our travel photo site, Viva la Voyage. This week we happen to be showing photos from Costa Rica, which of course is what I show in this site every day. Some of our favorite Costa Rica photos are featured on our site that provides new photos from somewhere in the world every Sunday. I haven't posted a sunset in a while, so here is another sunset from the balcony/patio of our Langosta Beach condo. The warmth of the sun is still burning through the marine layer of clouds, which will add definition to the sun as it descends into the Pacific. The hustle and bustle of the office, traffic, and the stress of work back in the USA seem a long way away, until we check our email and answer telephone. On our travel photo site, Viva la Voyage, this week we are showing some from Merida, the largest city in the Yucatan Peninsula of Mexico, which has retained some of its Spanish colonial charm and has a museum that showcases the Mayan civilization that preceded the Spanish conquest. This is my favorite photo from 2009. I was out on a fishing trip off shore from Tamarindo in May with my two sons. We found ourselves in the midst of a huge pod of hundreds of dolphins jumping all around our boat. In every direction, the water rippled with fins breaking the surface and dolphins looping up for short breaths of air. It is not common, however, to see a dolphin flying completely out of the water, except at Sea World. It is even rarer to be able to capture a photo of a dolphin in the wild completely airborne. Usually, by the time I see them, point the camera and snap the shutter, the dolphin is back down in the water, particularly if the camera is set for auto focus, because the auto focus interjects a short delay in the shutter reaction. So how did I get this photo of the dolphin flying through the air? Dumb luck. I was focusing on the group of dolphins in the center of this picture and was taking their photo when the dolphin the the background went flying up out of the water. The worldwide Daily Photo bloggers have done something different this year. Rather than picking our favorite photo for the January 1 first-of-the-month Theme Day, an extra theme day was added for today, January 15, for our favorite photo of the year. I hope you have enjoyed this choice, as I have enjoyed sharing it and my other photos with you. Here is one more photo of the waves crashing on the beach in Costa Rica. After several days of showing white foam on the beach, I thought I would show a photo of multiple shades of blue on the beach. In this area of the beach, there are volcanic rocks that provide wonderful tide pools at low tide and that cause the waves to splash up to add a visual and sound accent to the normal roll of waves onto the beach. Here are white-out conditions on a Costa Rican beach. Following up on yesterday's post, this shows what the waves look like if you stand your ground and face them head-on. When I look at the photos of the cold and snow that I see many Daily Photo bloggers post this time of year, I appreciate their sacrifices to subject themselves to harsh conditions to share photos of their locations. They inspired me to do the same and to sacrifice myself to share a photo. I hope you agree that it was worthwhile to get a face full of churning salt water to get this photo. That is certainly a much lesser sacrifice than going out in the snow for some winter photos. There are lots of photos of white snow on Daily Photo sites around the world at this time of year. I thought those of you in cold climates might like to see some of the "white stuff" we have along the Costa Rican Pacific Coast beach resorts. It is really tough to be outdoors in Costa Rica this time of year. You need to protect yourself against the elements of mother nature. Instead of overcoats, scarves, hats and mittens, you will need a swim suit, sun block and sun glasses. Here is a wave about to break as it rolls in towards Langosta Beach, near one of our condos. I took my little waterproof camera out into the surf to see what type of photos I could get. My success rate for photos worth posting was rather low, as it was hard for me to hold the camera still when I was being sucked into the curl of a wave and was about to be tossed back down. It was a fun experiment with the waterproof camera. I will show a few more attempts during the next few days. Here is a side view of a wave that is heading towards Langosta beach. I took the photos of the surfer that I showed the last few day from shore, using a telephoto. I wanted to try some closer angles so I walked out into the surf with a little point and shoot waterproof camera. I would rate the results of my little in-the-surf photo shoot as rather mixed. It did provide some different angles and perspectives on the waves not obtainable from land. Some of the photos were disappointing, however. One of the problems is that as I was being pulled, pushed or tossed around by a wave, as I was when taking this photo, it is impossible to hold the cameral still. Today is Sunday, so we are showing new photos on our travel photo site, Viva la Voyage. This week we are showing some from Merida, the largest city in the Yucatan Peninsula of Mexico, which has retained some of its Spanish colonial charm and has a museum that showcases the Mayan civilization that preceded the Spanish conquest. The surfer I showed yesterday rode the wave to the point where he decided it was time to end his run and head back out for the next wave. So how did he end the run? The surfboard does not have any brakes, of course. He just stepped off and disappeared into the foam. In the distance, it looks like there is another good wave heading in to shore that he will miss. But, no worries. There will be more waves just like it rolling in. Vacationers in Tamarindo, I am sure, would much prefer the task of worrying if they can make the next wave than worrying if they will make the next traffic light, subway train, or whatever other aspect of their everyday lives back home cause them stress. On our travel photo site, Viva la Voyage, we are showing some photos what we think is the world's most artistic and impressive cemetery, Recoleta, in Buenos Aires, Argentina. Tamarindo is best known as a surfing town that has evolved into an international beach resort, so it is time for a few surfing photos. This surfer is near the end of the run on this wave, as the wave has already crested and broken. As you can see, after crashing, this wave is taller than he is. I took this photo on Langosta Beach, just below our condo. Do you think he will have a graceful end to his run? As regular readers of this blog will anticipate, the answer will be shown tomorrow. On our travel photo site, Viva la Voyage, we are showing some photos of the Recoleta Cemetery in Buenos Aires, Argentina. If you have not been there, check out why it is a major tourist attraction. When it is sunny and hot, even a baby iguana finds some shade. I took this photo on the short path between our Langosta condo and the ocean. I used to confuse baby iguanas with geckos, but my younger son taught me the difference. If they have claws and are out during the day, they are likely baby iguanas. If they have toes that are round pads and are out at night, they are geckos. Iguanas use their claws to climb trees, where they spend most of their time. We see geckos in the evening. Often a small gecko will climb the outside wall of the condo building and hang upside down on the ceiling of our balcony. The round pads for toes are not suction devices. They have tiny hooks under the pads that enable them to hang upside down. On our travel photo site, Viva la Voyage, we are showing some photos of what we think is the world's most artistic and impressive cemetery, Recoleta, in Buenos Aires, Argentina. Come to the website for a visit. The iguana at the airport seems confused and unaware that he should be up in a tree, which is where iguanas spend most of their time. This green iguana is where he belongs, and his coloration is adapted to camouflage him. Not surprisingly, this species is called a green iguana. My Travelers' Wildlife Guides book on Costa Rica (by Les Beletsky) makes the observation that green iguanas "don't move much, and when they do it's often in slow motion" and that "they are fun to discover, but boring to watch." One of the readers of this blog left a comment several days ago saying that she thought iguanas were green, so I decided to post this photo to show the difference between the green iguanas and black iguanas. Green iguanas are a little larger than the black iguanas. They grow to 2 meters (6.5 ft) in length. Green iguanas have more prominent scales running down the ridge of their back and dew sacs under their chin. Even though the iguana was unsuccessful at renting a car at the airport, his trip was not futile. Perhaps because he could not rent a car to drive to a restaurant, he decided he might as well stop by for a bite to eat at the airport. The man who runs the little snack shop at the airport shares his food with several iguanas. Here he is feeding one of them. Black iguanas move much faster than green iguanas. If you walk up to them aggressively, they will even scamper off briskly. This week on Viva la Voyage we are showing some photos of the Recoleta Cemetery in Buenos Aires, Argentina. Come to the website for a visit. Hey! Are you open? Is anyone there? The iguana I showed yesterday pressed his nose up against the glass door on the car rental office, apparently frustrated that the office was closed. Iguanas are peaceful and do not bother people. As you can tell, this iguana allowed me to kneel down right next to him to get this photo from very close range. Right next to the door where this iguana was standing was the airline ticket counter where people were checking in for their flight. There were probably 10 people on a bench within 10 feet (3 meters) of this iguana. Although this iguana was frustrated at not getting inside the car rental office, he was not done wit his airport visit, as I will show tomorrow. This is called a black iguana, but they are actually brown or olive-brown, with black bands, as you can see in this photo. Ctenosaurs lack the spiny scales running down their back that green iguanas have. On our travel photo site, Viva la Voyage, we are showing some photos what we think is the world's most artistic and impressive cemetery, Recoleta, in Buenos Aires, Argentina. Come to the website for a visit. The iguana that I showed yesterday had business at the airport. He appears to want to rent a car. There are several car rental places in town in Tamarindo, so he did not have to walk out to the airport for his car rental. This is the most common type of iguana that we see around Tamarindo. It is called a black iguana, or iguana negra, of course, in Spanish. The correct biological name for this type of iguana is ctenosaur. Today is Sunday, so we have new photos on our travel photo site, Viva la Voyage. We are showing some photos what we think is the world's most artistic and impressive cemetery, Recoleta, in Buenos Aires, Argentina. Come to the website for a visit. This is a scene I bet you do not see at home. This sidewalk is the walkway from the airport "terminal" to the boarding area and to the parking lot at Tamarindo airport. Everyone going into or out of the airport walks on this sidewalk, but who is using it now? An iguana. Does he have a plane to catch? Where is his luggage? Maybe he is just here to greet a passenger or say goodbye to a tourist he has befriended and who is leaving for home? Iguanas at times do take a stroll on the sidewalks of Tamarindo. This iguana is not just out for a stroll, as he did have business at the airport, as I will show tomorrow and the days that follow. On our travel photo site, Viva la Voyage. this week we are showing some photos of the holiday season in Vienna, Austria. We hope you find them of interest. The changing sea, sun and sky illustrates the theme for today's worldwide Daily Photo Theme Day, which is "Change." I considered showing photos that would show the change in Tamarindo over the years, but a photo of new condo buildings forming a skyline above the trees is not very dramatic. So, I decided to return to the elements that provide part of the natural beauty of Tamarindo -- the changing sea, sky and sun. All three elements are in motion. The sea rolls in with multiple wave breaks in Tamarindo, both along the beach and a little off shore. We love the constant sound of the surf and the variation in the waves rolling in to shore. The sun and sky change each afternoon, as we begin to speculate about what type of a sunset it will be. Often the sky is clear, but if there are clouds, they will usually enhance the sunset. And while we are on the subject of "change," we should reflect upon climate change and the effects of all of the carbon emissions that we are dumping into the atmosphere. Costa Rica is on pace to be the world's first carbon-neutral country -- by 2021. We hope that the rest of the world will make comparable advancements, even if it is difficult. Our photos this week on Viva la Voyage show winter in Vienna, Austria. Compared to Tamarindo, that is another form of change.